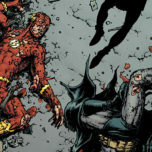 “Running Scared” reaches its epic conclusion in The Flash #27, which picks up right in the middle of an all-out brawl between Barry and Eobard as the Flash museum crumbles around them. The fight eventually spans the entire Earth, and the beauty of these opening pages cannot be overstated. 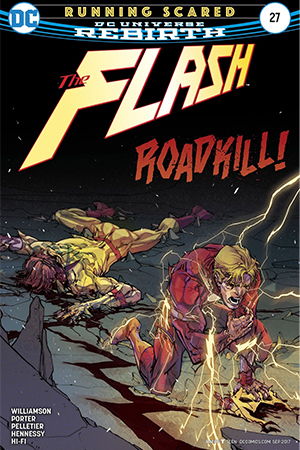 Reading Reverse Flash’s letter to his idol while watching the destruction this so-called love wreaks serves as a perfect emblem of how dangerous obsession can be – and now Barry himself is falling prey to it as well. 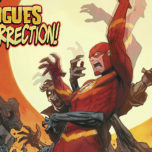 The art achieves a chaotic effect that blends perfectly with Williamson’s depiction of a frantic and desperate hero whose encounter with the Negative Speedforce has altered him beyond recognition. But even in the midst of a worldwide speedster battle, The Flash finds the time to drop an easter egg or two. 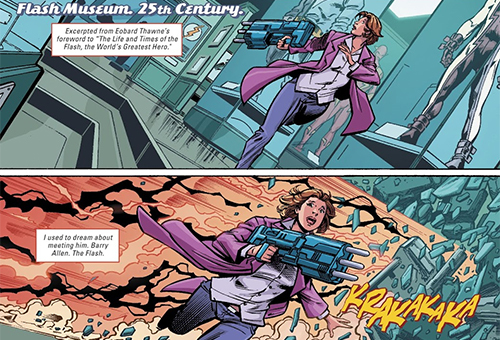 As Iris West finds herself nearly swept up by the rubble inside the Flash museum, there is a certain speedster suit immortalized next to her. Dare we hope that this means the future is not yet lost and we may one day see Bart Allen, our beloved Impulse, again? 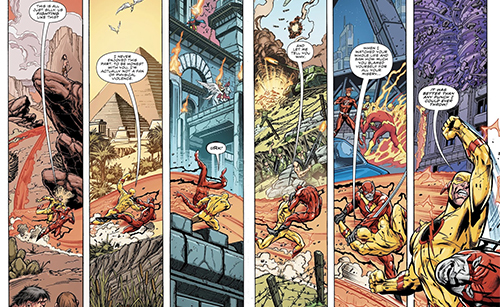 A large portion of The Flash #27 consists of the clash between the two men, so it falls on the shoulders of Howard Porter and Paul Pelletier to maintain the momentum of the story and keep the panels from running together. 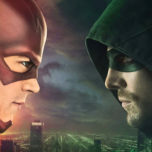 They are certainly up to the task, alternating between frightening close-ups of Barry’s newfound rage or Eobard’s pure glee and cinematic visions of the speedforce’s electricity sparking throughout. The battle extends through time as well as space, which allows for even more ways to spice up the issue and keep the ongoing battle fresh. But the story is circular in a very poetic sense, so of course Flash and his Reverse wind up back at the museum next to Iris despite traversing all of Earth’s history in their hatred of each other. It is here that the changes which affected Barry are more evident than ever, and Williamson does a fine job showcasing how truly negative he’s become in such a short time. Hi-Fi’s color palette also changes dramatically to suit the new Speedforce flowing through Barry, yet the issue still feels completely at home in the current run. 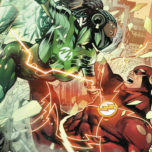 There is more than just a physical fight in The Flash #27, though, and the confrontation with Reverse Flash takes a huge emotional toll on both Barry and Iris. Whether their reactions this issue can be attributed to the effects of the Negative Speedforce – after all, Iris was shocked by it too – or simply to a lack of communication in their relationship thus far, it’s clear they both have a lot to work through in order to have a future together. Verdict: 4.5 out 5 stars. This was a great way to wrap up the “Running Scared” arc, taking Thawne out of the picture for now without eliminating him entirely. 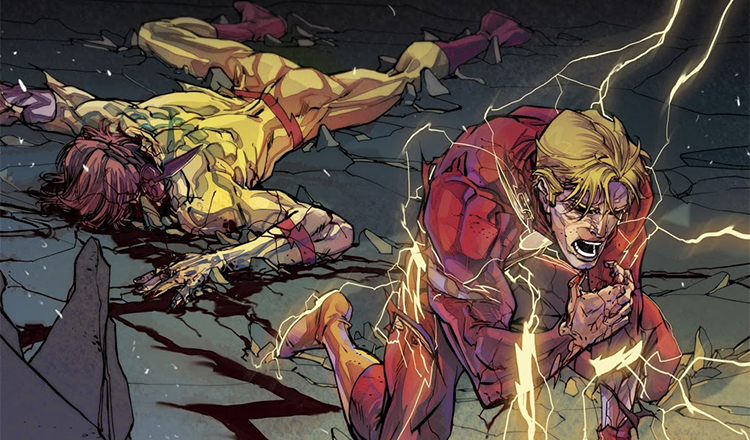 The Flash #27 also set up the next obstacle in Barry’s path very well, establishing both the physical changes that have taken place as well as the emotional hurdles he will have to overcome. If I have any complaint about this arc, it’s that Wally West has been out of commission for longer than I’d like. Speaking of which, it’s about time Iris found out about older Wally, so hopefully the next few issues will bring both West boys back into play.